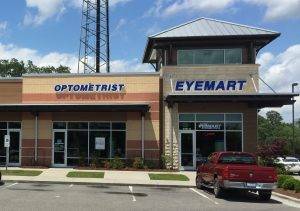 With an office conveniently located adjacent to Eyemart Express in Wilmington, NC, Carolina Vision Associates, O.D., P.A. has been serving North Carolina's New Hanover County for more than 4 years - with most patients coming from Kings Grant, Mayfaire, Ogden, and Murrayville. Schedule an eye exam with one of our eye doctors, then stop by Eyemart Express to see their many frame lines, and get your glasses in about an hour.